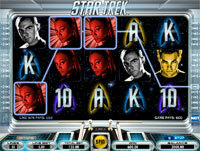 Star Trek Slots is an online slots game which is based on the 2009 movie directed by J.J. Abrams, but as anyone who has seen that movie will already know, it features the original Star Trek characters that have been around since 1966. That means you can expect to see Captain James T. Kirk, Mr Spock, Scotty, and Lieutenant Uhura featured on the five reels of this rich and immersive slots game which really does have to be experienced to be fully appreciated. 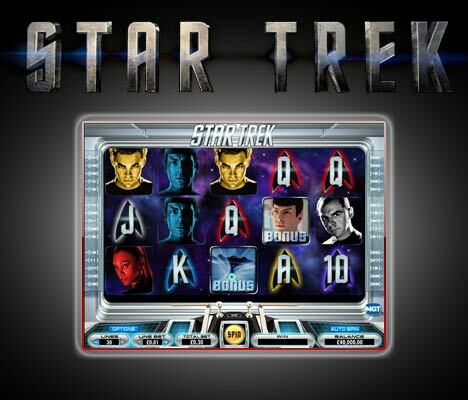 The Star Trek movie on which this slots game is based tells the story of how Captain Kirk and his crew embarked on a mission to save the United Federation of Planets from Nero, a Romulan from the future. Fans of the original Star Trek television series (which was created by Gene Roddenberry) will have enjoyed a great sense of familiarity with this movie, because although most of the cast members were new to the Star Trek franchise (a notable exception being Leonard Nimoy, who played an older version of himself from the perspective of the timeline used) the Star Trek universe and characters portrayed here didn’t stray very far at all from the original. The Star Trek slots game has 30 pay lines and five reels, though the reels don’t look much like reels in a conventional sense. The only visible parts of the reels are the symbols that are featured on them, and the reels themselves appear to hang unaided against the star-filled backdrop of deep space. The symbols used here include the playing card ranks 10, J, Q, K and A, the characters Spock, Scotty, Kirk and Uhura (as portrayed in the 2009 movie), a Star Trek symbol and Bonus symbols. A superbly atmospheric soundtrack plays throughout the Star Trek game, and larger wins are celebrated with animations, fanfares, explosions and more. There are also four free spins bonus rounds that can be triggered, which we will discuss a little later. Your first task once you are on board the Star Trek slots game is to select the number of pay lines that you want to activate and the amount of money that you want to bet on each. You can play 1, 3, 5, 9, 15 or all 30 pay lines, and you make your choice by clicking the - and + arrows on either side of the LINES panel at the foot of the screen. Your stake per line is adjusted similarly via the LINE BET panel. A useful TOTAL BET panel automatically multiplies the selected number of pay lines by the selected stake so that you can see how much each spin of the reels will cost in total. Having adjusted the pay line and bet settings, you are ready to play. Press the SPIN icon at the bottom centre of the screen and the five Star Trek reels will spin smoothly for a short while and then stop. Your active pay lines will be assessed and if you have won a prize it will be paid out immediately, with the total amount won being displayed in a WIN panel to the right of the SPIN icon. If you have the symbols required to trigger one of the four possible free spins bonus rounds then the game will proceed to the relevant round automatically. All wins are good news in the Star Trek slots game, and range from the modest to the truly massive. A complete schedule of prizes that can be won from various combinations of symbols can be viewed by following the “pay table” link in the game, and familiarising yourself with this helps to increase the excitement of playing because you can then anticipate winning as you watch the symbols fall into place. The bigger your win in the Star Trek slots game, the more extravagant the celebration, with special audio segments and animations helping to highlight your achievement. A slots game... but not as you know it! From the popular American television program launched in 1966 to the the online casino scene in March 2011. You'll find all your favourite characters on the reels; Scotty, Kirk, Uhura and Spook. 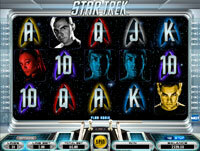 Watch the Star Trek Slots game in play and see the wins roll in.